View More In Stair Parts. 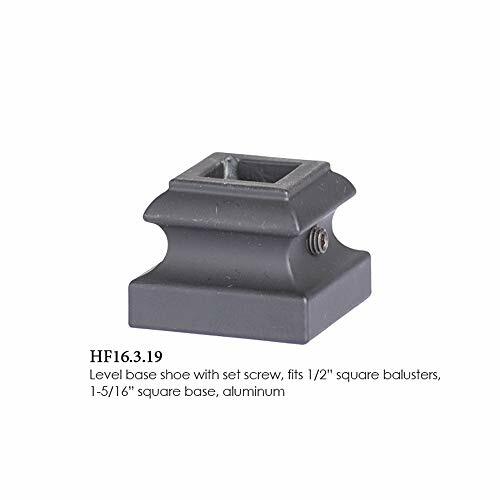 This Satin Black 16.3.19 shoe works with 1/2" square iron balusters and this shoe sits on a flat surface. It comes with a set screw. If you have any questions about this product by House of Forgings, contact us by completing and submitting the form below. If you are looking for a specif part number, please include it with your message. B52 Black Handrail Aluminum Stairs Kit 5 Ft and 1.97"diam, Includes 3 Wall Brackets. 4ft. Handrail - Anodized Aluminum with 3 Matte Nickel Wall Brackets and ADA Returns - 1.6" Round - OVERALL LENGTH: 53"